So it seems as though that Mother Nature has finally decided to make up her mind by keeping with seasonal temps! Don't get me wrong, I love warmer days, but when it's in the middle of fall, it causes all the leaves to fall and die out prematurely and I feel as though I've been jipped a season, that's what happened last year. Do you guys remember when it was 70 on Christmas Eve?! She made up for it though with Storm Jonas (insert eyeball roll emoji). With cooler temps, I'm able to fully embrace and have fun with one of my favorite types of clothing and that's outerwear! You all know how much of a fan I am of leather jackets and faux fur vests, but I also love a great poncho, too! The thing with ponchos, is that although their sizing is generally one size fits all, many of their designs and styles aren't. If you have a larger bust, you know exactly what I'm talkin' about, girl. Am I right or am I right? So, I've complied a list of some tips and suggestions for selecting the most flattering styles that will have you looking chic, feeling fabulous, all while keeping warm; high five! APPLE & HOURGLASS SHAPES: I first want to point out that when mentioning to the hourglass in this case, I'm referring more to those who have a larger bust. It's important to understand that not every woman who has an hourglass figure has a larger bust or is notably voluptuous. What categorizes this shape is the proportion between both the bust and hip ratio, in which is the width of the bust is measured, not the size of the breast per se. I wanted to mention this because this is a question I often get asked. When seeking to avoid appearing larger or wider, I suggest you focus in on the overall design of the piece, as well as how it lays on the body. The first poncho can be worn with the hem straight across, which can emphasize the width of your body, especially if the front is shorter. Instead, I suggest you position it diagonally, which will slim the entire midsection, since the eye is being redirected and not moving directly across. This is not to say that you shouldn't consider styles that are straight in the front, though. Take the second one for instance. What makes this particular one flattering is that it features a v-shape pattern, somewhat like a chevron print, that causes the eye to narrow in and once again, slims the midsection. The tassels at the hem also redirect the eye to the hips, which can in the case of the apple shape emphasize lower curves. Lastly, the the third poncho features a plaid print, which I feel is a more flattering option than larger horizontal stripes. Again, this not to say that if you have larger breasts, you can't wear stripes, we talked about how you can and should here. When working with such a large statement piece, however, size and pattern can create a larger impact and can exaggerate various features and if that's not something you're looking for, then I suggest you opt for plaid or tartan rather than horizontal stripes. Also, the poncho has a button closure in the center, which not only looks super chic and makes life easier by not having to worry about it falling off your shoulders, but it once again, visually narrows in the body with the small exposed area peeking through the center. PEAR & RECTANGULAR SHAPES: For these two particular shapes, larger graphics, exaggerated textures, and details are flattering, as they help to balance out curvy hips for the pear shapes and create volume & dimension for the rectangular shape. 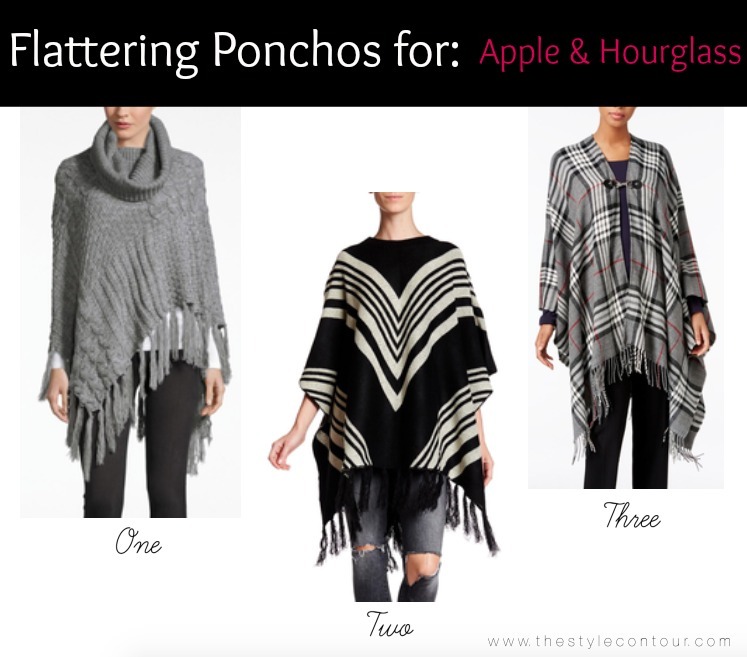 For this particular body shape (rectangular) it can be most flattering to position the poncho diagonally, as suggested for the apple shape, to prevent the body from appearing too boxy across both the midsection and hip area. Speaking of the hip area, if you're a bit self-conscious about your hips (which you shouldn't be because honey, you're fabulous *finger snap*) then I'd suggest avoiding styles that have large details, such as pom poms that fall right at the widest part of the hips. 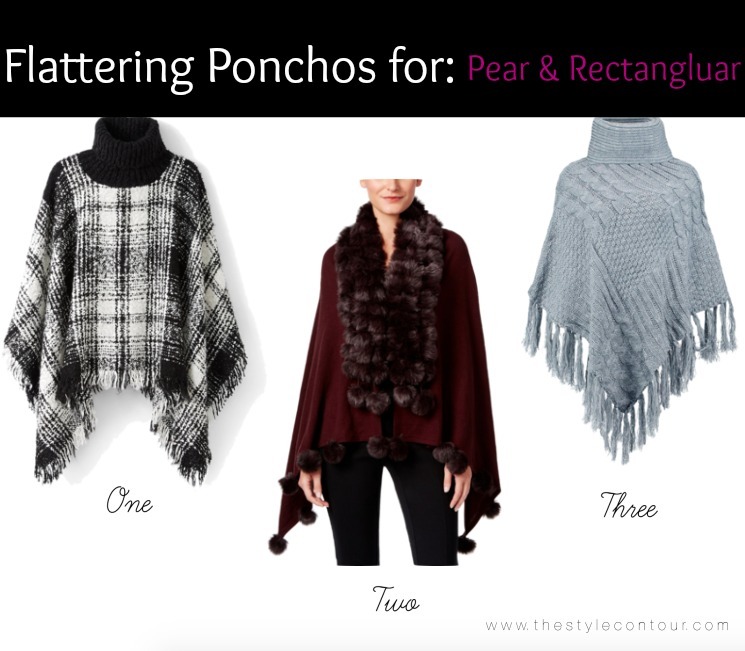 Again, by positioning the poncho diagonally, you can avoid this exaggeration or opt for longer styles like #2. 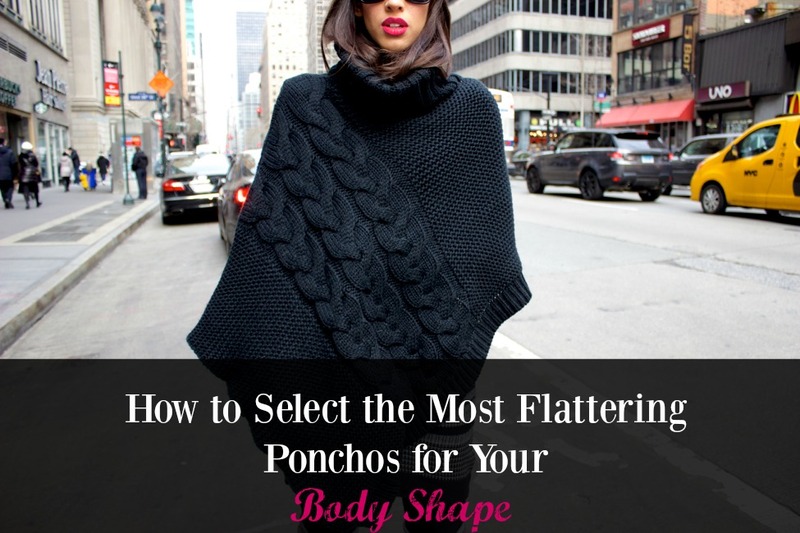 I hope you found this post helpful, my gorgeous friends, in selecting the most flattering poncho styles for your body shape. At the end of the day, I always suggest that you wear what you feel most confident in and hopefully my ideas are aligned with that! I also want to mention that you can position your blanket scarves in a way that can create the illusion of a poncho, getting double use out of them, the choice is yours! Thanks so much for stopping by and let me know if YOU like wearing ponchos during the fall, too! I hope your day is as fabulous as YOU!